In the season finale of the Big Bang Theory, Sheldon uses Shrödinger's cat to "console" a worried Penny over her decision to go on a date with Leonard. He compares Erwin Schrodinger's 1935 thought experiment to Penny's chances of having a romantic relationship with Leonard: "either the cat is dead or alive". 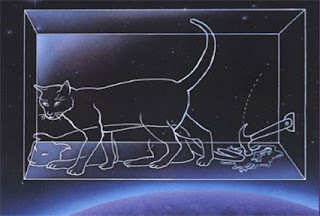 Of course, Shrödinger's cat was created as an attempt to show the absurdity of particular views on quantum mechanics at the time, collectively known as the Copenhagen Interpretation. The thought experiment, roughly speaking, goes something like this: A cat is placed in a sealed box with a flask of poison. There is a 50/50 chance of a quantum mechanical system triggering the release of the poison and killing the cat. Here's where it gets tricky. There is no way of knowing what happens to the cat unless the box is opened. If we open the box, we are taking a measurement of a certain state, and this act in itself causes the cat to be either dead or alive. If we never open the box, the cat can be thought of as both alive AND dead (think quantum superposition, existing as a superposition of multiple states). The quantum system doesn't have to conform to one state or the other if a measurement is never taken. Sheldon thinks (from a scientific standpoint-not from any emotional opinion) that Leonard going on a date with Penny will either work, or will be a disaster.Their relationship can't be successful and be a disaster simultaneously. Towards the end of the episode, when Leonard picks Penny up before the start of their date, he asks her if she's ever heard of Shrödinger's cat. She respond yes, and he kisses her. The cat's alive. Is there a time limt. I mean, if you do nothing then the cat will surely die. Leaving you with only one logical conclusion: open the box. So the whole concept of the cat being dead or alive is moot. Relating this to quantum computing, leaves you with one result; on or off.